The footage exposed on 60 Minutes of sheep on-board five separate voyages was horrific and truly harrowing. Australians were sickened to discover the level of suffering sheep face and, unsurprisingly, continue to be outraged that this is what sheep endure for weeks at a time under Australia’s care. With Australian sheep exposed to extreme conditions and temperatures, especially during Middle Eastern summer months, the long-haul export of live Australian sheep is simply cruel and indefensible. This isn’t one bad journey, one bad exporter, or a few animals that have slipped outside the system. This is what’s happening to animals routinely, under Australian standards, and under the full control of the Australian Government, live export companies and the live export industry. It is an industry with a long history of major disasters and the live export of sheep has been in steady decline for more than a decade. It’s time to phase-out long-haul live sheep exports once and for all. Live sheep exports are based on a business model that can’t survive if animals don’t suffer. This is already being evidenced with one exporter, Livestock Shipping Services, deciding to temporality halt all live sheep shipments during the Middle Eastern summer months due to requirements for stocking densities to be decreased. This is further proof that even the slightest improvements for animal welfare make the trade unviable. 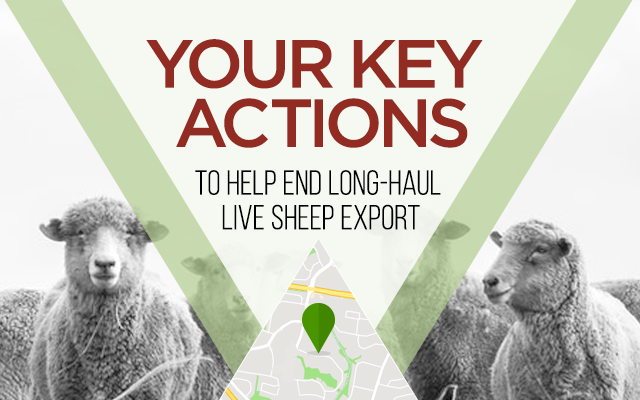 Does your MP support legislation to phase-out live sheep exports? There is currently legislation before parliament that is proposing a five-year phase-out of the trade. Do you agree with this? Will you support the bill on behalf of your constituents? Independent polling showed around 3 in 4 Australians want to end live export and these numbers are consistent or even greater in rural/country areas and towns. Cross-section of political support – where do you stand? There is support for protecting Australian sheep and ending this trade from across the political spectrum – this is unprecedented and shows the need to transition away from this industry is now. Where do you stand on this issue? Investment in a chilled and frozen meat-only trade would prevent the suffering inherent in long-distance sea transport and save millions of animals from the cruel fate awaiting them at their destination and on-board ship. A better future for Australian farmers and Australian rural communities means turning our attention to alternatives that support regional economies as well as support good animal welfare. The Government’s own McCarthy Review found an immediate need to change the industry’s heat stress risk assessment model from one based on mortality rates to one based on animal welfare measures (recommendation four of the report). In light of this new evidence and known risks, the Government is continuing to grant export permits for voyages during the Middle Eastern summer period and instead wants “more time” to work on how recommendation four will work. At Senate Estimates hearings in May, a senior Department of Agriculture and Water Resources officer confirmed that this recommendation would effectively “lead to the closure of the trade in the summer months” due to the massive reductions required in stocking density. If McCarthy’s recommendation was actually implemented, it would have reduced the number of sheep on ships to an extent that would have effectively ended Middle Eastern summer sheep exports but the government appears to be determined not to let that happen.